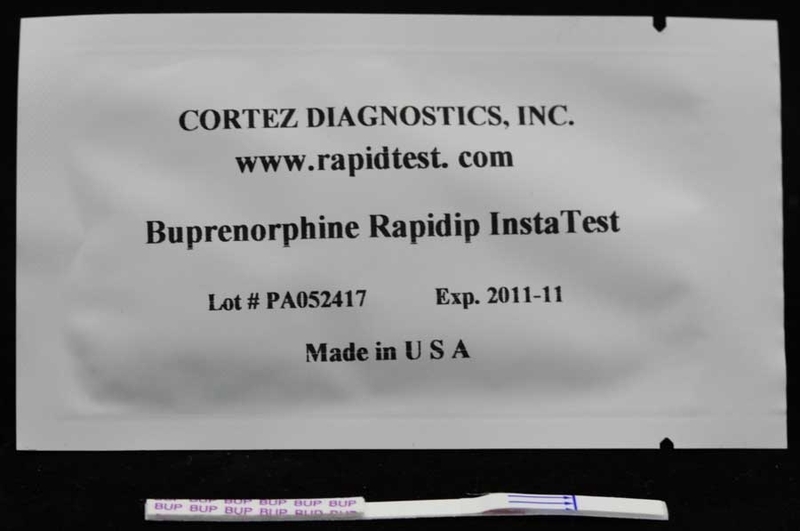 The Buprenorphine Drug Test (BUP Drug Test), or The Cortez Diagnostics Inc. OneStep BUP RapDip InstaTest, is an immunochromatography based one step in vitro test. Our buprenorphine drug testing kits are designed for qualitative determination of the major metabolite of buprenorphine, buprenorphine-3-Î²-d-glucoronide, in human urine specimens. This assay has not been evaluated in the point of care location and is for use by Healthcare Professionals only. This Buprenorphine Drug Test (BUP Drug Test) provides only a preliminary analytical test result. A more specific alternative chemical method must be used in order to obtain a confirmed analytical result. Gas chromatography/ mass spectrometry (GC/MS) has been established as the preferred confirmatory method by the Substance Abuse Mental Health Services Administration (SAMHSA). Clinical consideration and professional judgment should be applied to any drug of abuse test result, particularly when preliminary positive results are indicated. The optional built-in Adulteration Test is for validation of urine specimen's integrity and must not be used for In vitro diagnostic use. The cutoff level for this Buprenorphine Drug Test (BUP Drug Test) is 10 ng/ml of buprenorphine, buprenorphine-3-Î²-d-glucoronide. For customized cutoff level Buprenorphine drug tests, please contact Customer Service. This Buprenorphine Drug Test (BUP Drug Test) is available in multi-panel, cassette, or cup formats. Rely on RapidTest.com to provide you with excellent rapid diagnostic tests.